Your old childhood coloring friends are all grown up! 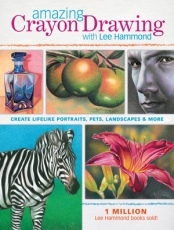 In this unique book, best-selling artist Lee Hammond proves that crayons are not just for kids anymore but can hold their own as a "serious" (if unexpected) art medium. Use Hammond's easy methods to create striking drawings that feature brilliant color and incredibly lifelike texture. You simply won't believe what you can accomplish with this familiar and affordable medium. Rediscover the creative thrill of opening the "big box," and infuse your art with a fresh sense of play.